For the short film, see Pâté (film). In French or Belgian cuisine, pâté may be baked in a crust as pie or loaf, in which case it is called pâté en croûte, or baked in a terrine (or other mold), in which case it is known as pâté en terrine. Traditionally, a forcemeat mixture cooked and served in a terrine is also called a terrine. 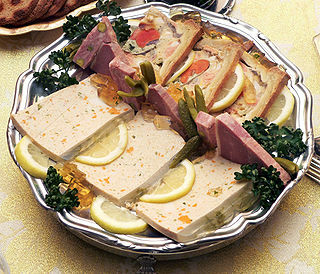 The most famous pâté is probably pâté de foie gras, made from the livers of fattened geese. Pâté en croûte is baked with the insertion of "chimneys" on top: small tubes or funnels that allow steam to escape, thus keeping the pastry crust from turning damp or soggy. Baked pâté en croûte usually develops an air bubble under the crust top as the meat mixture shrinks during baking; this is traditionally dealt with by infusing semi-liquid aspic in the hollow space before chilling. 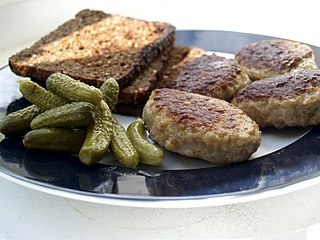 In the Netherlands, Finland, Germany, Romania, Hungary, Sweden, Denmark and Austria, some liver pâtés are shaped as a soft, often spreadable sausage, called leverworst (Dutch), pate or lebăr (Romanian), májpástétom/májkrém (Hungarian), or Leberwurst (German). In the United States these are sometimes called "liverwurst" (mixing English and German), or braunschweiger. Some liverwursts can be sliced. 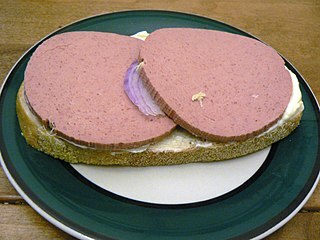 In the US, sliced liverwurst is used as a sandwich filler. Others are spreadable as are most French or Belgian pâté; these types are more popular in the United Kingdom. In Scandinavia, leverpostej (in the Netherlands: leverpastei) is a popular baked pâté similar to the French pâté en terrine, usually made of lard and pork liver. In Poland, pasztet is made from poultry, fish, venison, ham, or pork with eggs, flour, bread crumbs, and a varied range of additions, such as pepper, tomato sauce, mushrooms, spices, vegetables, ginger, nutmeg, cheese, or sugar. In Russia and Ukraine, the dish is mostly prepared with beef, goose or chicken liver and thus is commonly known as pechyonochniy pashtet (Russian: печёночный паштет, "liver pâté"), however other meats also can be used. Unlike the Western European method the liver is first cooked (boiled or fried) and mixed with butter or fat and seasoning such as fresh or fried onion, carrots, spices and herbs. It can be further cooked (usually baked), but most often is used without any other preparation. In Russia, the pâté is served on a plate or in a bowl, and is often molded into the shapes of animals, such as hedgehogs. A similar recipe is known as chopped liver in Ashkenazi Jewish cuisine, where schmaltz is used instead of butter and hard-boiled eggs are usually added. Another common type of pâté in Jewish cuisine, also popular in Russia and Ukraine, is vorschmack or gehakte herring (chopped herring). In the former Yugoslavia, pašteta or паштета (a thinly pureed pâté) is a very popular bread spread usually made from chicken, beef, turkey or less commonly tuna or salmon. In Vietnam, pâté (gan xay) is commonly used on bánh mì baguette type sandwiches. Pâté of this type is more commonly made from liver. ^ a b Julia Child (1964). Mastering the Art of French Cooking. New York, New York (USA): Alfred A. Knopf. pp. 564–576. ISBN 9785879620764. Retrieved 12 October 2017. ^ Darra Goldstein (1999). A Taste of Russia: A Cookbook of Russian Hospitality. Russian Information Service. p. 33. ISBN 9781880100424. Retrieved 12 October 2017. ^ Елена Молоховец (1861). Подарок молодым хозяйкам (in Russian). Санкт-Петербург. A Gift to Young Housewives, English translation: Joyce Stetson Toomre (1998). Classic Russian Cooking: Elena Molokhovets' a Gift to Young Housewives. Indiana University Press. ISBN 978-0-253-21210-8. Forcemeat is a mixture of ground, lean meat mixed with fat by grinding, sieving, or puréeing the ingredients. The result may either be smooth or coarse, depending on the desired consistency of the final product. Forcemeats are used in the production of numerous items found in charcuterie, including quenelles, sausages, pâtés, terrines, roulades, and galantines. Forcemeats are usually produced from raw meat, except in the case of a gratin. Meats commonly used include pork, fish, seafood, game meats, poultry, game birds, veal, and pork livers. Pork fatback is preferred as a fat, as it has a somewhat neutral flavor. Braunschweiger is the name for several types of sausages in different regions. In the German language, Braunschweiger is the demonym for people from Brunswick, but under German food law refers to a variety of mettwurst. In Austria, Braunschweiger is known as a type of parboiled sausage (Brühwurst), while American Braunschweiger is often confused with liverwurst. Offal, also called variety meats, pluck or organ meats, refers to the internal organs and entrails of a butchered animal. The word does not refer to a particular list of edible organs, which varies by culture and region, but includes most internal organs excluding muscle and bone. As an English mass noun, the term "offal" has no plural form. Some cultures strongly consider offal as food to be taboo, while others use it as everyday food, or in delicacies. Certain offal dishes—including foie gras, pâté and sweetbread—are considered gourmet food in international cuisine. Others remain part of traditional regional cuisine and may be consumed especially in connection with holidays. This includes Scottish haggis, Jewish chopped liver, U.S. chitterlings, Mexican menudo as well as many other dishes. Intestines are traditionally used as casing for sausages. Liverwurst, leberwurst, or liver sausage is a kind of sausage made from liver. It is eaten in many parts of Europe, including Austria, Bulgaria, Croatia, the Czech Republic, Denmark, Finland, Germany, Hungary, the Netherlands, Norway, Poland, Romania, Russia, Serbia, Slovakia, Slovenia, Sweden, Ukraine, United Kingdom; it is also found in North and South America, notably in Argentina and Chile. Smørrebrød is a traditional Scandinavian open-faced sandwich that usually consists of a piece of buttered rye bread (rugbrød), a dense, dark brown bread, topped with commercial or homemade cold cuts, pieces of meat or fish, cheese or spreads, and garnishes. A turnover is a type of pastry made by placing a filling on a piece of dough, folding the dough over, sealing, and baking it. Turnovers can be sweet or savory and are often made as a sort of portable meal or dessert, similar to a sandwich. They are often eaten for breakfast. Cypriot cuisine is the cuisine of Cyprus and is closely related to Greek and Turkish cuisine; it has also been influenced by Byzantine, French, Italian, Catalan, Ottoman and Middle Eastern cuisines. Charcuterie is the branch of cooking devoted to prepared meat products, such as bacon, ham, sausage, terrines, galantines, ballotines, pâtés, and confit, primarily from pork. Chopped liver is a liver pâté popular in Ashkenazi Jewish cuisine. It is a common menu item in kosher delicatessens in Britain, Canada, South Africa, and the U.S.
Vorschmack or forshmak is an originally East European dish made of salty minced fish or meat. Different variants of this dish are especially common in Ashkenazi Jewish and Finnish cuisine. Some varieties are also known in Russian and Polish cuisine. The liver of mammals, fowl, and fish is commonly eaten as food by humans. Domestic pig, ox, lamb, calf, chicken, goose, and cod livers are widely available from butchers and supermarkets. Animal livers are rich in iron, copper, the B vitamins and preformed vitamin A. 100 g cod liver contains 5 mg of vitamin A and 100 µg of vitamin D.
Bánh patê sô, also known as Pâté chaud, is a Vietnamese savory puff pastry. The pastry is made of a light layered and flaky exterior with a meat filling. Traditionally, the filling consists of ground pork but chicken and beef are also commonly used now. This pastry is French-inspired but is now commonly found in bakeries in both Vietnam and the diaspora, much like the Haitian patty. This is a list of steak dishes. 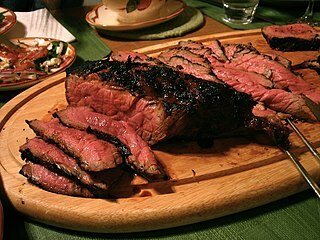 Steak is generally a cut of beef sliced perpendicular to the muscle fibers, or of fish cut perpendicular to the spine. Meat steaks are usually grilled, pan-fried, or broiled, while fish steaks may also be baked. Meat cooked in sauce, such as steak and kidney pie, or minced meat formed into a steak shape, such as Salisbury steak and hamburger steak may also be referred to as steak. This is a list of stuffed dishes, comprising dishes and foods that are prepared with various fillings and stuffings.